Despite the fact that there are still four National One league fixtures remaining, in many ways Saturday will be the first occasion when the magnitude of Hartpury’s achievements this season are properly recognised. In front of what is expected to be a good crowd, including ex-players and coaches gathered for this season’s inaugural Alumni Rugby Reunion, Hartpury will be presented, officially, with the league trophies and medals following the game with Loughborough Students, irrespective of the outcome on the day. The Loughborough match will come less than 48 hours after the College’s latest appearance in a BUCS (universities) final at Twickenham and, again regardless of the outcome in that game, there will be at least one student trophy on display with Hartpury already having won the league phase of this season’s BUCS Super Rugby competition. Amidst the celebrations, of course, there is still a game to play and Loughborough come to Gloucestershire in a solid mid-table position, having flirted with relegation in the previous campaign. The Students have been involved in a number of exciting and high-scoring fixtures this season, including a 35-32 win at home to Blackheath last time out, although their return of three wins from 10 games in 2017 is less than they might have hoped for after a promising autumn. 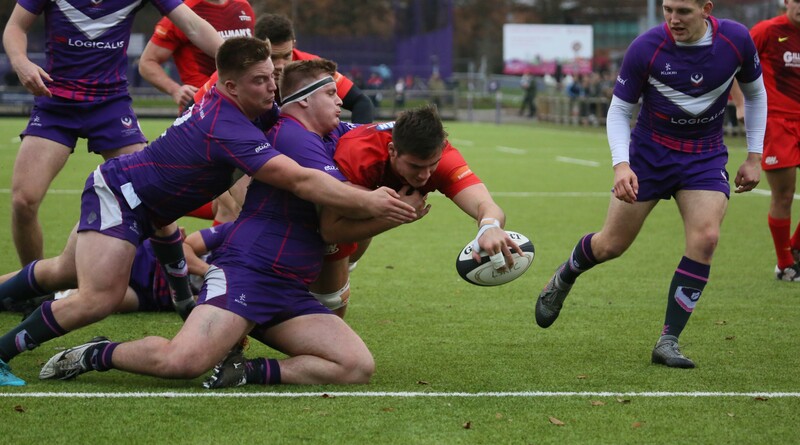 “They’ve had a decent season although they’ve probably tailed off a bit in the last few weeks in the league, as well as getting knocked out of the BUCS competition” said Hartpury Director of Rugby, John Barnes. Certainly, there was no lack of motivation on the part of last week’s opponents, Darlington Mowden Park where, despite the 34-26 win, Barnes was not entirely happy with his team’s performance. In a physical game, more than one Hartpury player picked up knocks, although none appeared to be more serious than that suffered by fullback Mike Wilcox, whose season now appears to be over after he sustained a knee injury in the build up to the first DMP try. The better news is that that some of the players absent from last week’s outing, including powerful centre Steve Leonard, should be fit for the Loughborough clash, although no final selection will be made until after the Twickenham final.